Her full name is Clara Anna Maria Antonia Wessely. Born in June 1815 (when the historical Congress of Vienna closes its works) she is the first daughter of Giuseppe (Joseph) Wessely (see topic), a rich Moravian merchant established in Trieste, and Elena Vianello, daughter of another wealthy Venetian merchant established in Salonica (Greece). We know nothing about her life in Trieste when she was a child. However we have her first image in a delicious miniature representing her playing with a drum. 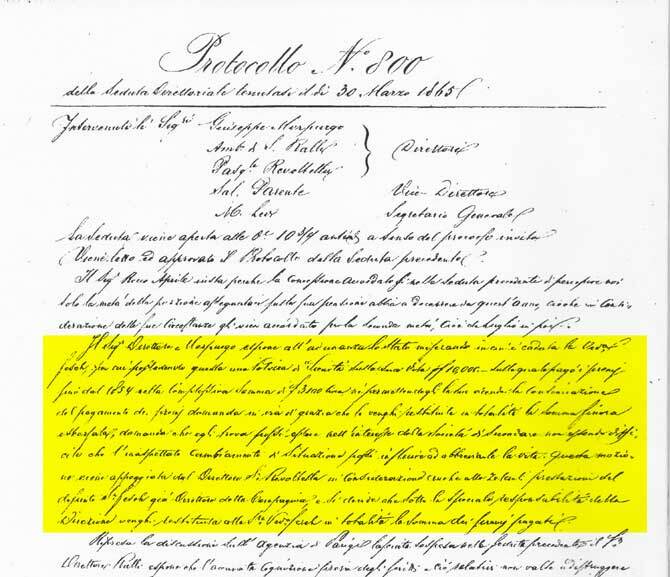 At the age of 18 he marries Gustav Adolf Fesch, a German young man (29 years old) of Swiss origin recently settled in Trieste and partner of the trading firm "Wessely & Fesch". To be noted that in those times Trieste was a true melting pot of peoples and races, crossroad of trades with all ports of the Mediterranean. Clarissa is a good example of her times: daughter of a Moravian and a Greek-Venetian, wife of a Swiss-German and Austrian-Italian herself ! Most probably the same year of her wedding she poses for a famous painter, Giuseppe Tominz, for her portrait. Giuseppe Tominz (or Jožef Tominc). The portrait, nowadays part of the private collection of one of her descendants, has been exposed for three months at the Museo Revoltella, Trieste's most important art museum. In 1853, at the age of 38 her husband dies during a smallpox epidemic and she remains a widow. According to the Trieste archives in 1857 she lives in Città Nuova n. 887, 2nd floor. This house is known as "Palazzo Gopčević", facing the Grand Canal, built in 1850 by Spiridione Gopčević (or Gopcevich), wealthy merchant and shipowner of Serbian origin. Maybe by coincidence (? ), one of the sons of Clarissa, Emil Fesch, three years later, in 1860, marries Adelheid (Malvina) Meticke, daughter of Ernst Meticke and Caterina Gopcevich. (sister of Spiridione). At the death of her husband she is among the guarantors of the firm "Wessely & Fesch", together with her son Emil. Twelve years later, when the firm closes down for bankruptcy, her signature is on a document by which all the goods of the bankruptcy are credited to the Baron de Rittmayer. Much later, possibly around 1880 she lives in the Casa Duma (see topic), the same building where her father Giuseppe was living. She dies in Trieste in 1894 at the age of 79.